Hobo Spiders are spreading, but now live in North Western United States including: Idaho, Oregon, West Montana, Northern Utah, Washington, Western Wyoming, and Colorado. They also live in Southern British Columbia. Hobo Spiders are large spiders, adults measuring up to about 2 inches long. Coloring is variable from light to medium brown. On back of head they have two dark stripes, with a lighter stripe in the middle. On the abdomen, Hobo spiders have a light stripe that runs down the middle, with triangle shapes on both sides of the light stripe. Legs are solid light brown with NO bands on them. Hobo spiders have feather like hairs that are only visible under a microscope @ 30x magnification or higher. Longer posterior spinnerets extend past abdomen. Coloring is so variable that examination of genitalia is BEST for correct identification. Hobo spiders live about 2-3 years. Mating season is September – October. 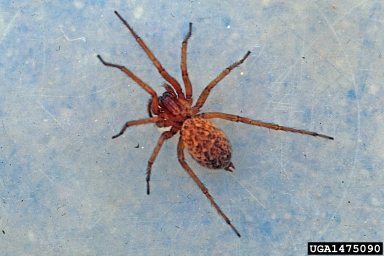 Hobo Spider Bites are often BLAMED on Brown Recluse spiders, but Brown Recluse DO NOT live in the North Western United States. Hobo spiders live in holes, cracks and crevices. Hobo spiders are bad climbers, and are rarely found above ground level. They like dark moist areas, including basements, window wells, and crawl spaces. Hobo spiders build Funnel Webs to catch their prey. Males wander from June to October for mating season. It has been reported that males are more toxic than females. Males are responsible for more BITES, because of their habit of wandering in search of a mate which brings them into contact with humans. In areas where the Giant House spider and the Hobo Spider live, the Giant House spider is more common than the Hobo Spider, except in Portland Oregon. Control Hobo Spiders with Professional Pest Control treatments focused on areas Hobo spiders live like: basements, crawl spaces, ground level, cracks and crevices. Outside, remove grass from around the foundation, and replace it with rocks or gravel several inches out from the foundation wall. Delivering Pest Control for Spiders throughout the Greater Phoenix AZ Valley.